I have an old Roland RE-201 Space Echo unit purchased some years ago from a specialist trader in vintage music gear. He typically scours the Malaysian rural countryside for his stock, as it is said most of the best vintage instruments can be found tucked away in an obscure kampung somewhere. People are generally surprised that rare music gear can be found in this part of the world. Maybe a lot of it was imported during the Kugiran Pop Yeh-Yeh era, and is now part of granddad’s curiosities collecting dust in the store. One collector who used to trade Space Echo units over the Internet said he even found some being used for karaoke. 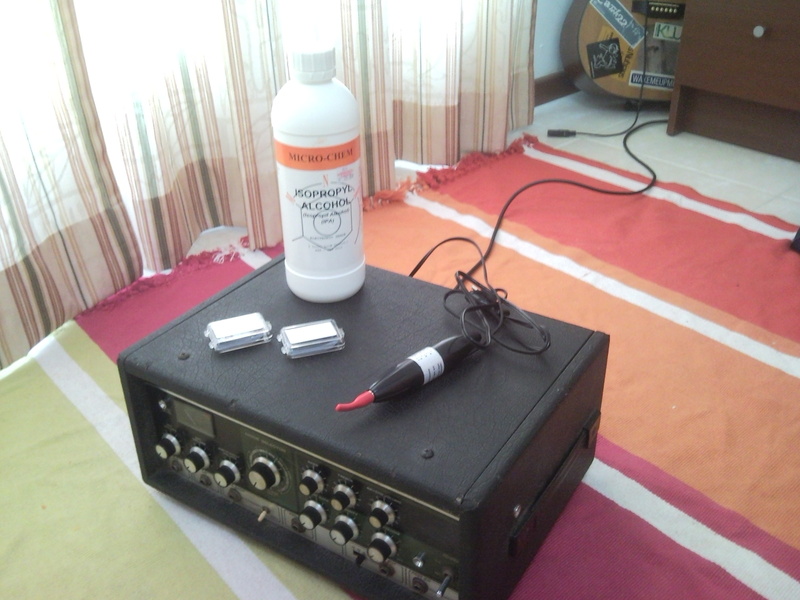 Whatever the history of my Space Echo, it was due for some maintenance. Although generally fine considering its age, tape units tend to lose high-end clarity after time. Their components need cleaning, tape heads need to be demagnetized and tapes need to be replaced. I had not done this since owning my unit so it was about time. After rounding up all the things I needed, I finally got around to the job. 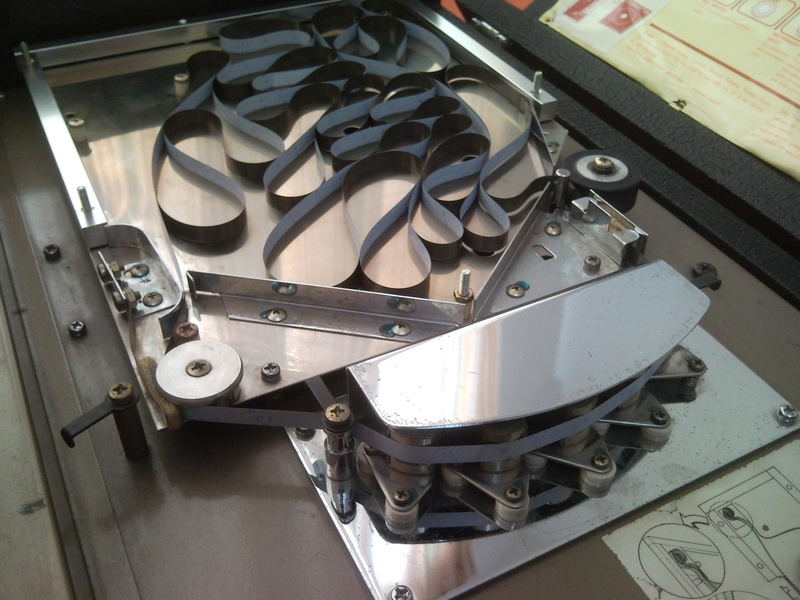 First the old tape was removed so the guts of the tape mechanism could be cleaned. It’s next to impossible to find tape head cleaning fluid these days. 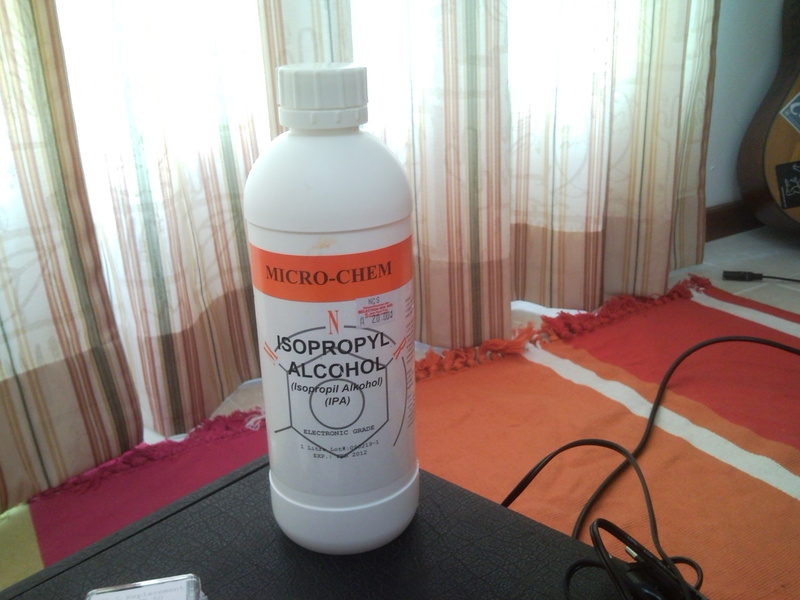 After some asking I discovered isopropyl alcohol, a multipurpose solvent that can clean tape heads and much more. Unfortunately it only comes in rather massive bottles. Using cotton buds dipped in the solvent I carefully went over all parts that came in contact with the tape. If there’s one thing I learnt from my time at SAE, it’s not good practice to clean rubber parts with alcohol, so for that I just used water. Once nice and clean, it was time to invoke the mysteries of demagnetizing. I’m not too clued in on the technicalities of why tape heads require demagnetizing. From what I’ve read on forums, it’s just something that needs to be done to restore their fidelity. I picked up my demagnetizer over EBay. There were quite a few options available, I went with one that fitted my budget and was available in 240V AC. Opening the package revealed a thoughtful message from the manufacturer. 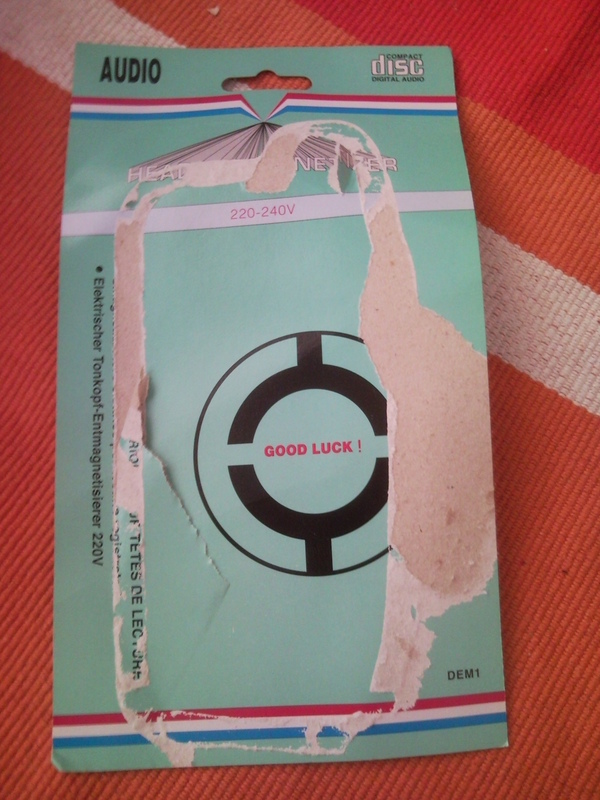 GOOD LUCK??? Is there something about demagnetizing that required a special amount of luck? Not exactly comforting. With that in mind, I took extra care to observe the intricacies of the demagnetizing ritual gathered from various sources. 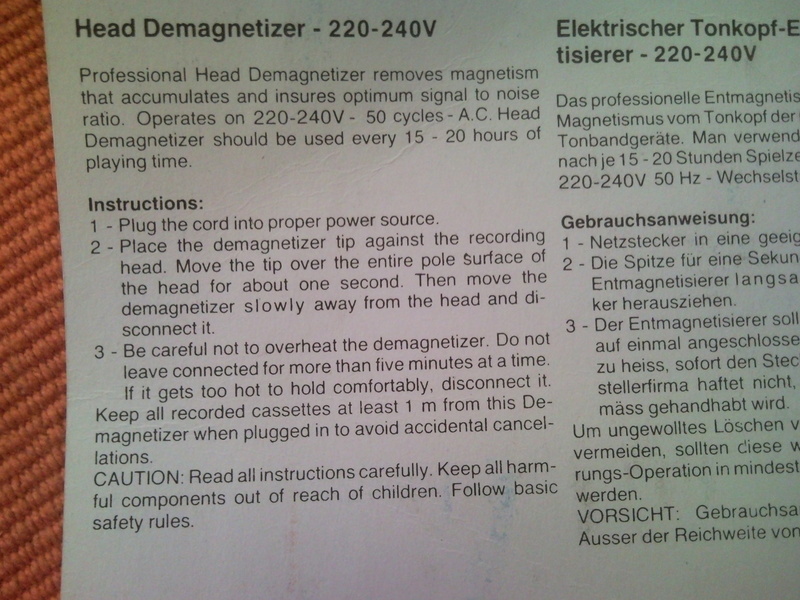 This involves turning on the demagnetizer some distance away from the heads, moving in slowly, sweeping the demagnetizer close to the head for about a second, repeating for each head, and then smoothly and slowly moving the demagnetizer away from the heads until a distance of 3 meters before turning off the demagnetizer. Any sudden movements and I risked rendering the head inoperable. 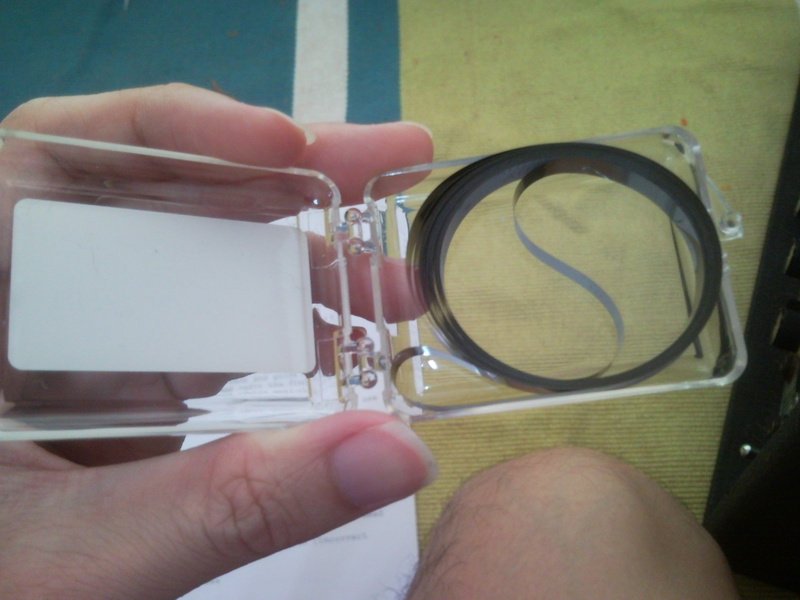 With that out of the way, all that was left was to insert some new tape, which I also obtained from EBay. The instructions recommend letting the new tape run for about 5 minutes at slowest speed to smooth out any kinks. For all that trouble, does my Space Echo sound any better? Well, it does, but not as much as I imagined. I guess there are other things to be considered. For one, the unit is still slightly noisy. 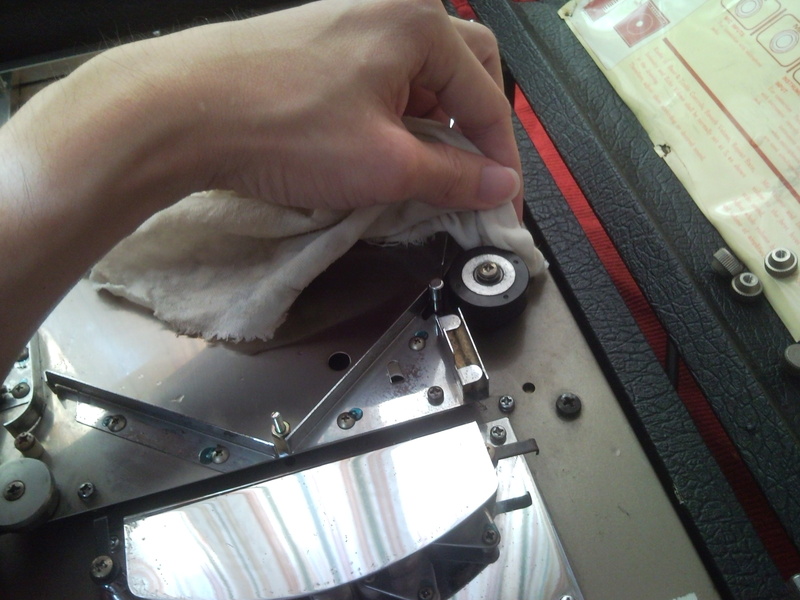 Not that I thought servicing the tape heads would magically kill noise. Maybe I’m too accustomed to noiseless digital effects units, but there’s no way I could record with the Space Echo and not resort to some noise suppression plug-in. Anyway, I’m glad to survive my first demagnetizing experience unscathed. If anyone has comments, questions or tips, do post below. This entry was posted on May 6, 2009 at 8:38 am and is filed under Audio Geekery with tags demagnetizing, isopropyl, RE-201, roland, space echo. You can follow any responses to this entry through the RSS 2.0 feed. You can leave a response, or trackback from your own site. Hi, thanks for posting this nice & detailed service guide. It is very useful. I think I am another lucky person who has just found this great echo machine sitting in a old pawn shop. I immediately bought it yesterday. However, the echo is not smooth. It sometimes produces pitch-shifted and vibrating echo, but not all the time. I suspect if this is the problem of some part of the tape. Did you experience this before? Do you think changing the tape or demagnetization would fix it? The “pitch-shifted and vibrating echo” should be the result of imperfections with the motor that spins the tape. I have it as well. 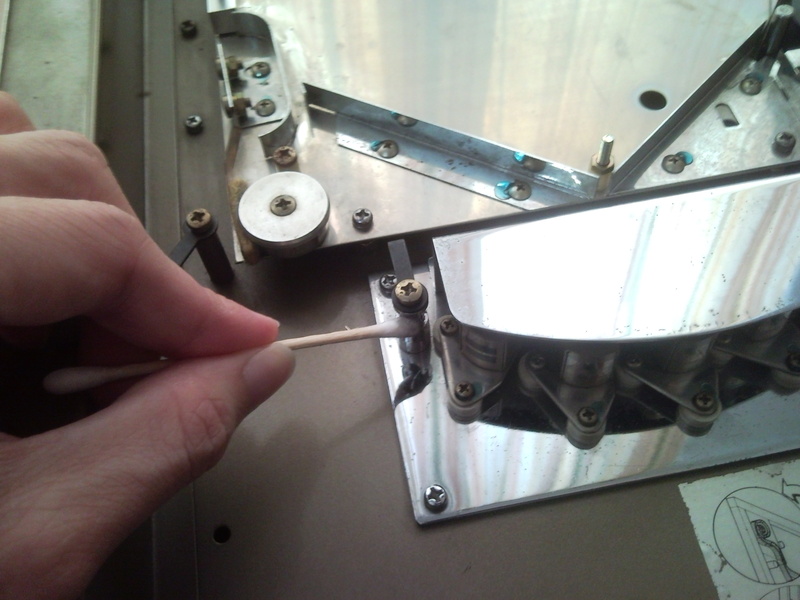 Changing the tape or demagnetizing won’t fix it, that’s to address loss of fidelity. Great article! The best I’ve come across on the net. I purchased my very own re – 201 yesterday. Its in unbelievable condition. The previous owner used it for a year in the 70s and then put it away in his attic, where its been in a case ever since. However… I’m finding that the echos that its producing aren’t as loud as they should be, and its not going in to self-oscillation. Do you reckon it could be the tape? It is 38 years old after all..( never been changed). I got three original, unused roland tape loops with the unit. I’m going to clean it as you described (as soon as I track down some isopropyl alcohol!) – but just wondering how you actually change the tape? Is it difficult? Would greatly appreciate any advice! Hey, congrats on your find! I’m no expert, it *may* be the tape. Try replacing it with the loops you got, if that doesn’t work maybe find some new tape online. It might also be the electronic components inside, some of them have a shelf life. A decent technician should be alble to replace those. It’s not hard at all to change the tape. Open the lid and turn the unit on to see how the tape rolls, take a photo if you can’t remember and just fit the new tape the same way. thx man .. really helpfull..
mine doesn’t .. do you know wht to do? 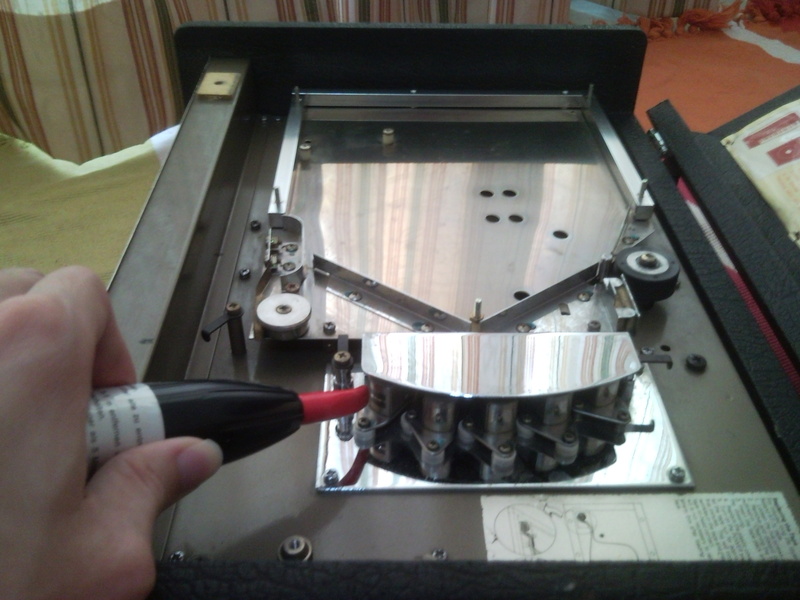 trying to find the trimpot called bias oscillator.. but have no idea where it is..
btw i have the same re201 version as you.. screw at the upper lid to open..
mine self-oscillates just fine… good luck! This was really freakin’ helpful!! Cheers a million!! I got a great unit straight from Japan. 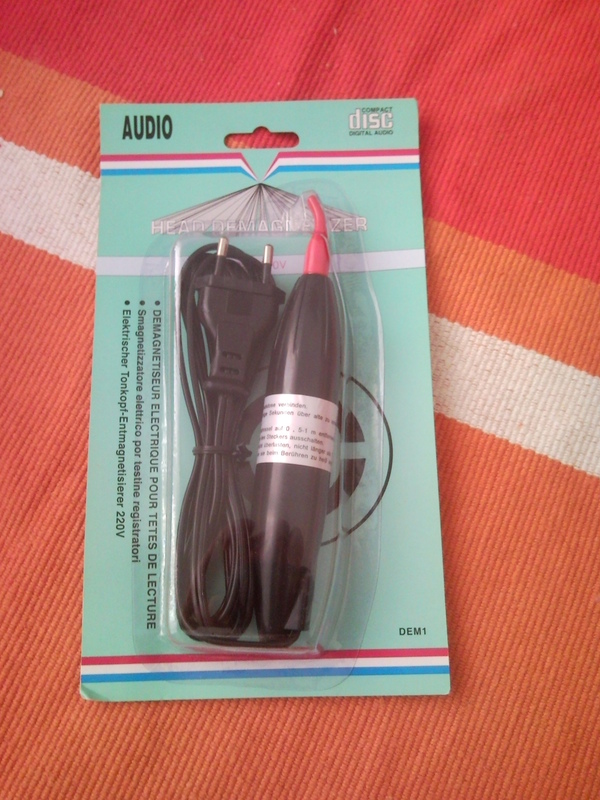 It works well, but me being the perfectionist, I thought I’d see if I could get better sound fidelity. I was just gonna use skin cleansing alcohol wipes – 70% alcohol – do you think this would do the job? Dude I have no idea, did you try? 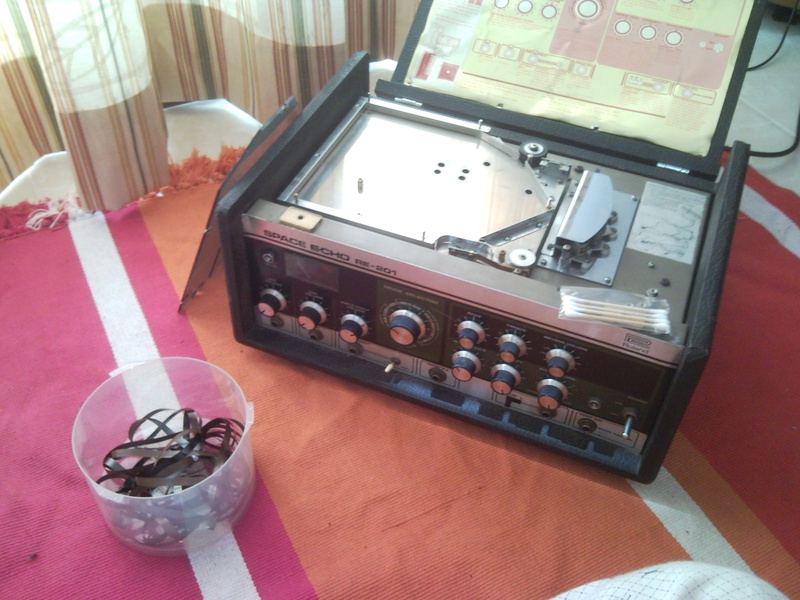 hello thanks for your post.. i have a RE 101 and now i have to replace the tape and demagnetize the heads!! is the first time for me with this kind of machine ..i hope it will work fine after the job..!! thanks a lot rock on cheers from Italy Peppe. I just bought a 201 and changed the tape (the old one was wrecked) when switching it back on the echo wouldn’t work at all. The reverb seems to be working fine tho..
DId the echo work before? I live in Perak and I was trying to find the Isopropyl alcohol for cleaning/sanitizing purpose but there is none of it in local pharmacy! Could you please tell me where did you get the big bottle? I got mine from Jalan Pasar KL. Try an electronics shop or hardware repair shop.